I have Geoff Rassmussen's Genealogy Daily calendar on my desk and I thought I'd share with you a particularly timely entry for today. It talks about the BCG Genealogical Standards Manual. It says "The BCG Genealogical Standards Manual explains the Genealogical Proof Standard (GPS). It provides standards for research, teaching and genealogical development. It includes examples of reports, proof summaries, compiled lineages and compiled genealogies." You can get the BCG Standards Manual from one of the booksellers I've mentioned before, or come to a genealogy conference and get it there. Coming from a librarian background, alot of the Manual is second nature to me. But I was thinking today, for anyone who comes to genealogy from other fields, this is a good place to get grounded in what is good research and what is not. I think as we have moved more and more onto the Internet to do research, we have to be really vigilant about our research methods and standards of proof. It is easy to get excited about a new find on the Internet and relax our standards. But we have to remember that the Internet is not throttled by the complexities of publishing and sometimes that makes for bad quality of information. The ease of publishing on the Internet also makes it easier for a wrong fact to perpetuate itself faster (think Internet hoaxes). I've been working on my lecture "Best Research Practices" and it just seems like that subject gets more and more important every day because the speed of information gets faster and faster. This technology tip from November 14th in the calendar sums it up nicely. "Always have a sense of skepticism with information on the Internet. Remember that even though hundreds of websites may provide the same information, they may all be citing the same inaccurate source. Always consult the original." Well said. Ok. This series is really getting drawn out. But it will be worth it. Slow and steady. You are going to call me the most spoiled genealogist ever when you see this one. One of the most gorgeous ways you can work on sharing your family history with your family is to do what my mother has done. My mom isn't particularly worried about adding more people to our family's genealogy, she is mostly concerned with making sure we know about our ancestor's lives. She really is the epitome of "sharing your family history with your family" and although I wasn't interested for alot of years, I'm living proof that you can eventually get them involved. Mom has had an incredibly busy life. From a family that was spread out over 40 years (My baby sisters were adopted when I was 18) to her mother being in a wheelchair for 30 years, Mom has had lots of people who have needed her attention. But she has plugged away at writing books about our ancestors. And over time she has accomplished alot. She sticks to the fairly close generations--people she remembers but I generally don't. I think that has been brilliant, because if she doesn't record their lives, I can't--at least not as well as she can. She has done a few on ancestors that she didn't know, and those have been harder. But they are all treasures in our family. 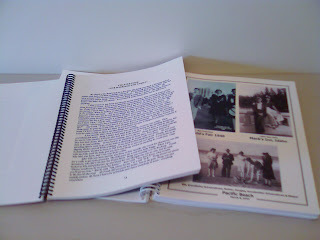 Mom has written several full sized books on her parents and grandparents, etc. These aren't usually grand productions as far as the book goes, just regular copies and spiral bound. She has usually started with an oral history, and scrapbooked some pictures into it. But the information is so wonderful to have. And they are grand productions to get written--definitely. But then--here is the kicker. For each of these people, she has put together a beautiful children's length book. These are gorgeous books and when I show them to people they are all agog. 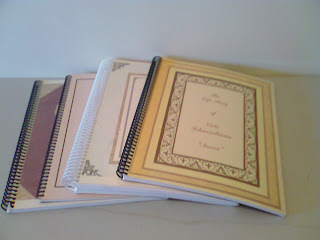 She has used Heritage Makers, but there are several companies that can put together books like these. I wish you could see them. For each ancestor, she has given them the theme of a value that they exhibited in their life. So my Great Grandfather that lived through the depression is "Charles Roswell Dana and the Power of Hard Work." And my handcart pioneer GGGGrandmother is "Jane Dorothy Culley and the Power of Perseverance." She does one page on their family of origin, one on their childhood, one growing up, one on courtship and marriage, one on their career, etc. They are so easy to put together, she actually got my Dad to do some for his Mother and Father. And even though they died when I was 16 and 22 respectively, I learned quite a bit I didn't know about their lives from Dad's little books. This short length is good for kids, but really for adults too. Anyone can digest this much family history. Even though they are expensive, it is easier to pick up with lots of pictures and a beautiful layout and binding. Earlier I wrote about the To-do chart, one of our new charts for the New FamilySearch database. The rollout marches on and more and more people are able to use the database. I wish it was coming faster, but hopefully they are getting it right. It looks like rollout will be complete sometime next year with access for people who aren't members of the LDS church as well. Several years ago we were asked with 6 other companies to become one of the LDS church's early commercial affiliates and to develop products to work with the new database that will eventually replace FamilySearch. We have since become one of the first certified affiliates. As we sat in the development meetings, we tried to come up with ways that Generation Maps could help the user navigate that database. We focused on getting things out and off the screen to be able to see the big picture--something we do best. Some of those ideas developed into the To-do chart, others developed into the Comparison chart. New FamilySearch is built to encourage collaboration. On each of your ancestors, you are able to see what other people have added about that person. And if someone adds an ancestor that might be the same as yours, you are able to look at that addition and link your people together. In this new database, every bit of information added is broken up into what is called assertion tags. Tags will be about a date, a place, a note, or anything. And every tag that is added can never be deleted, only disputed. Our comparison chart is the only place you can see every single tag for a person. So, if you have alot of cousins who also do genealogy (like I do,) the information on your ancestors might be plentiful, like the chart to the right. The Comparison chart is 24 inches wide and as long as your information goes. On the Comparison Chart, we have color-coded each of the tags according to who contributed the information. If your family is like mine, you know that some researchers are more meticulous in their research than others are. This chart helps you follow what each researcher has done. It is good to see everyone side by side according to the information they have contributed. We are hoping this overall view will help you evaluate the information in this new database to see what you can verify and what needs to be cleaned up. There is also a mark on each disputed tag, so you can see what has been asserted, and decide if there are other tags that need to be marked as disputed. So far, the users who have bought copies of this chart have been really excited to see the overall picture of this database. One lady said she thought she had been the only person working on her Eastern European lines, and was thrilled to find other cousins to collaborate with, and to be able to see exactly what they had done and compare it to her work. Like with all of our charts, it is *EASY*. 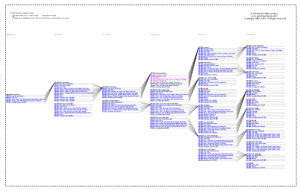 Just go to http://www.generationmaps.com/ and click on Interpretive Charts for FamilySearch. Choose your chart, then on check out, type in your username and password for New FamilySearch, and the ID number for the person you want the chart to start with. Depending on the amount of information on your lines, download may take a couple of minutes. But then you are done. We figure out the layout, the printing, etc. You just enjoy it when it shows up in the mail. Along these same lines, one of the other early affiliates, RootsMagic, unveiled their upcoming New FamilySearch capabilities on their blog on Friday. It looks good. The affiliates are going to make it so much easier to use this database. Check it out. Genealinspired--Tenacity and the Field of Dreams. Another Genealinspired story from Marlo and Leanna Schuldt. Our children and grandchildren need encouragement and direction to achieve their full potential. They will benefit from experienced and trusted role models to guide them forward. We need to teach them about the ingredients necessary for success in any endeavor – tenacity and hope. The following true story provides the perfect example. In 1950, thirty-five year old Esbern Baadsgaard, his wife Mary Christensen and their four children were living at Lakeshore, Utah. Economic times were hard making it difficult for most men to provide for their family. Es had to work two jobs. By day, he was a bricklayer enduring the 100 degree summer heat for 12 hours and then off to the farm working the fields until after dark. Es decided he could make some extra money by planting more corn. He scraped together the money to buy the seed. That was the easy part since he had to clear the field of weeds which was backbreaking work. He struggled for three long years fighting the weeds that strangled his corn plants. The fourth year he planted again and the weeds fought back. This big strong man who was the rock everyone leaned on sat down on the ditch bank, his head in his hands, and sobbed feeling totally defeated by the weeds. However, he continued to fight the weeds that summer and was finally rewarded with a crop he could harvest. Today we see the fruits of his efforts in a beautiful the little field of healthy corn. A few years later Es found another disguised field of dreams. He purchased an old abandoned drive-in movie theatre. 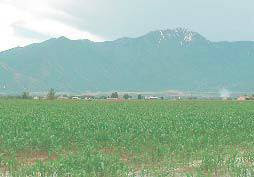 Like the corn field, he struggled for many years to pay the property taxes and to develop the land. After several years of sacrifice he was able to sell property for a substantial amount to the Albertson’s Food Market chain who wanted to build a mini mall on his field of dreams. Marlo and Leanna Schuldt work with Heritage Collector--a versatile software that helps you organize your family history files. Organize all your photos and family history files. Quickly find any photo or file in seconds. Easily label everyone in a photo using hotspots. Create and share slide shows on CD/DVD. Automated backup system to protect your family history. Use and run the program on an external hard drive for added portability. Watch tutorial movies to learn how to use the program. Create PDFs and much more. I'm glad this award has been going around because I don't think I could have kept this list to 7 if I hadn't seen the award already on some of my other favorite blogs. And I can't believe the blogs above haven't gotten one yet. Hopefully I'm the first. 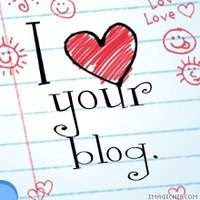 For another list of great blogs, check out the bloglist on my facebook page. Go get inspired and find a great project to get working on. Giving a gift of a family history item can be a good way to share your family history with your family. And putting together family history gifts gives you a deadline--always a good thing in genealogy. My family made a pact several years ago that we would only give family history gifts at Christmas time--none of us need any other fluff for Christmas--and it has been a wonderful thing for us. My Mom is always a little more stressed through the Christmas season because she is trying to get a genealogy project done on top of the normal schedule, but the payoff has been worth it. Computerized information, transcribed letters, scanned pictures, video. Yearly occasions also make great deadlines for family newsletters, updates of the family scrapbooks or personal histories. New Year's or birthdays make a good time to get those things done. My mother has asked for only one thing from each of us for Mother's day--again she doesn't need anything else--a page of a memory from our childhoods for a scrapbook. It has only been a couple of years but is already getting to be quite a book with lots of fun memories in it. You might think you have a family that isn't all that interested. A couple of thoughts: 1)back to our digital archiving discussion, even if the gift isn't terribly appreciated, you have made another copy of your data in case of a problem. And 2)I was one of those uninterested recipients for many years. But eventually it kicked in (kicked in hard obviously). Don't give up, they may be soaking in more than you think they are. So, lets see, it is the middle of September, you still have time to do something spectacular in time for the winter holidays. What are you going to do? I'm learning quite a bit about the history of my own life (besides exploring my family's history)by participating in these blog carnivals. I'm thankful my Mom is helpful enough to be my co-conspirator. She suggested this picture for the "Crowning Glory" theme. 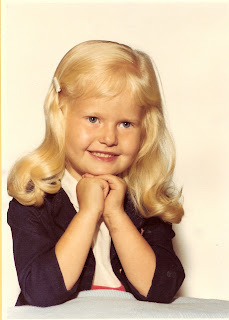 Apparently, when she took me to the local drug store for a picture for my 4th birthday, she wanted to pull my hair back into ponytails or a bun like she usually did. I didn't know until today, that I threw a 4-year-old fit and wanted my hair down. She was worried about how it would look, but now this is one of her favorite pictures. She says my hair really was my "crowning glory" and this about the only picture we have of it down. I guess I'll have to listen to my kids more. My children thank you, Footnote Maven, for hosting the Carnival of Images. I have to mention how much I was inspired on Thursday when the vendor's hall didn't open until later and I had some time to sneak off to Independence Hall. On the way out to the conference, I grabbed the book 1776 by David McCullough that I hadn't yet taken the time to read. I spent some time getting myself re-immersed in the patriot's cause with this well written book. 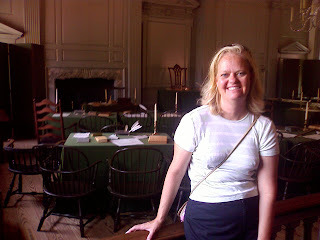 While I don't descend from any of the Signers of the Declaration, I was so moved, and so grateful to them, standing in those same places that they did. While at the conference, I had a great conversation with someone who had come out to Pennsylvania to research her ancestors there. She was able to find land records and go out and actually stand on the land her ancestors had settled. What a moving experience that is. If you haven't done that yet, you should try it. There is such a connection to be found in standing in the place where something important to your family happened. And while this wasn't my family's stomping grounds, many things that happened in Philadelphia changed the history of my family. I'm so grateful to those men who were strong and brave enough to found this country on the freedom that I now enjoy. If you don't know about Martha Mercer, you should. I got to spend the FGS conference next to her, and even though we didn't get much time to talk, it was nice to see her and get to talk to her a little. 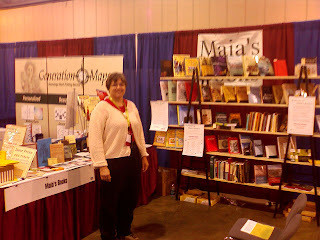 Martha runs Maia's Books & etc. an online Family History book store that mostly displays at genealogy conferences but also has a brick and mortar store October through January in the Columbus Ohio area. I brought home an American Family Paper Dolls: from the Pilgrim Period to the Civil War by Tom Tierney for my daughter this time. Martha has always had the best collection of family history items for children and I have bought many things for my family from Martha. Several years ago I bought the "Go Ask Your Grandparent" game from her as well as the "Family Lore Game." She has lots of great paper doll books and Memory Scrapbooks that are great for gifts. She also has everything else under the sun genealogy. 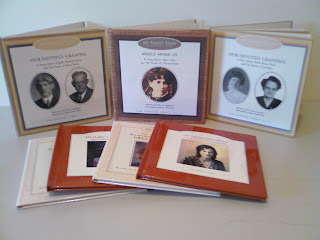 At FGS she has several of your core genealogy reference books, along with several Pennsylvania specific items. Take a look around Maia's Books. I'm sure you can find something to further your genealogy endeavors. ›What will interest your family. ›What can be applied to your family history. Not all of the ideas will apply, but being the librarian/researcher, I have come up with too many--I'm sure you'll be able to find something that fits with your family. Pictures are always good to spark interest and further questions and stories. Who do I look like? What are family traits? I'm sure if you have a good collection of pictures you'll be able to come up with people who look like the person you are trying to interest. These are some from my family that look similar to me. Do you think so? Isn't Kim (on the left) the cutest thing? Same Age/Interests ~ Pictures and artifacts are especially good when they relate to what the person you are trying to interest is experiencing in their life. Pictures of ancestors when they are the same age, report cards, drivers licenses, marriage licences, etc. These sailor/brother pictures actually come from different branches of the family. Or maybe you have artifacts or pictures of the same hobbies. I have a friend who's son became all interested when he found out his grandfather was also on the debate team and was given his yearbook. And my kids love my parents' high school yearbooks and especially the report card that shows that grandpa got a C in math. I have a second grade report card that shows that I was too talkative :-). Gotta love that. I've been asking around for genealinspired stories. Here are a couple from Cina and Diana at Ohana Software. 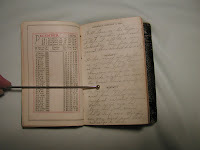 1870 diary and was struck again by the similarities in our temperament and talents. At 25, she lived at home and made her living as a seamstress. She married at age 29, had three children (one died at 13 months) then she passed away at age 47 leaving my grandfather (age 15) and his sister (age 8). My heart went out to her and I felt that she understood my feelings. I also knew that she lived through times of trial and so could I. Since then, I’ve learned of ancestors who lost five out of seven children between the ages of 6 days and 11 years. With their two surviving children, they left their home and family in France and moved to America. Another ancestor became an orphan in her early teens. 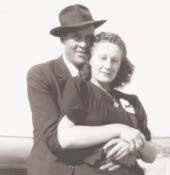 I draw strength and perspective from these loved ones and my life is richer for knowing their stories." "This probably is not what you had in mind, but I love this story. For years I have been cleaning up all the genealogy my Grandmother had gathered. Every Memorial Day my grandparents descendants meet at the Spring City cemetery to honor all our ancestors buried there. Then we go to the Church right next to my grandparents home for lunch. My son was not supposed to go because that year he had been diagnosed with Cancer and his treatments had put his blood count very low. The weather was very cold and could be very harmful to him. But he showed up anyway. I was very mad. We decided to give him a family blessing, one of which we, as a large family, had not done together for a very long time. My uncles and cousins all gathered around him. As the prayer was administered I felt the presence of many of my ancestors, the women were around me and the men were around my son. I did not dare open my eyes, because I did not want to lose this wonderful peaceful feeling. After the blessing many came over to me and told me they too had felt the presence of others, but they did not know who they were. I knew who they were because I had been taking care of them for years. Because I had taken care of them, they were now taking care of me and my family. My son's next exam showed the Cancer was gone. 12 years later he is still Cancer free." Thanks Cina and Diana. If you have one you would like to add, let me know. Taking a break here to show off the item I chose to bring to the Carnival of Genealogy's "Show and Tell." I always loved show and tell at school and could never decide which of my treasures to share. Still can't. So I hope we do this one again. When my Patriarchal Grandmother Hortense Carpenter died, she left instructions that each of her grandchildren should receive a quilt that she had sewn. She had made many beautiful quilts that were distributed to her 11 grandchildren. All except me--the oldest grandchild. Somehow (and after a certain relative took a couple of extra quilts) all of the grandchildren got one but there wasn't one left for me. I wasn't really upset about it, I had inherited several things from my grandmother, but my mother was really frustrated that I hadn't received one of my grandmother's beautiful handcrafted quilts. Grandma died in 1991. In 1996, my mother was at the family condo and looking at one of the beds, realized that there was one more of my grandmother's quilts that had been overlooked and was being used as a bedspread there. She snatched it for me and brought it home to give to me. In the days before she could give it to me, I suffered the miscarriage of my first pregnancy, a pregnancy we had been waiting and hoping for for a long time. My mother gave me the twin size, thick, warm, corduroy log cabin style quilt the day after we found out that the baby had no heartbeat. Over the next couple of days, following surgery and through intense emotional despair, I had this quilt wrapped around me constantly. 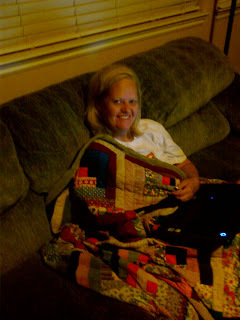 My hormones were adjusting and I was freezing cold for several days, so even at work, I kept this quilt around me. It was like a huge warm hug from my grandmother. 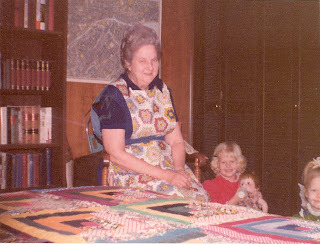 Several years later, I discovered a picture of me and my grandmother while she was working on this quilt. It was Christmas 1974 and Grandma had made one of those typical scrumptious Christmas dinners. Grandma was a retired home economics teacher and there was nothing domestic that she didn't do perfectly. My sister and I played under most of the quilts Grandma had stretc hed out on the quilting frames. I remember building wonderful forts and playing with our dolls in our own little world under there. And eventually she taught us to quilt. I have one of her sewing machines and I have made several quilts on my own quilting frames. More recently, as my wonderful children arrived, and grew big enough to understand, I have wrapped them in this quilt, and told them about how much I wanted and waited for them, and how much I loved my grandmother. As we have cuddled under this quilt, they have learned of her sewing talents, but also of her adoration of me, the long walks we had in the mountains near her home and how she taught me the names of all the wildflowers there, and many other things I loved about her. I miss my Grandmother but I am thankful my children and I can have a hug from her any time.